Goodson Painting offers a variety of painting and staining services for drywall, plaster, trim, cabinets, handrails, stairs, floors, and more. Turn to us for wallpaper removal, textured finishes, and faux wall finishes. All surfaces will be expertly prepared, to ensure a superior finish. Call Goodson Painting Company for all your exterior painting needs, including: siding, gutters, fencing, decks, patios, stone walls, wood trim, shutters, porch floors, metal basement entrances, and more. We also offer pressure-washing services to give your home an inexpensive face-lift. We are more than just painters. At Goodson Painting, our carpentry services include the installation of dry wall, crown molding, chair rails, wainscoting, casings, baseboards, archways, door slabs, and pre-hung door units. 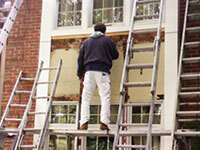 We also patch and repair drywall, plaster walls, and rotted wood. Goodson Painting Contractor has been helping homeowners in Montgomery County, Bucks County, and the surrounding Philadelphia areas improve their homes with anything from a fresh coat of paint to a complete transformation, making each room into a masterpiece. Goodson Painting handles anything from a regular one to two coat paint job to issues with water damage and historical preservation practices. Goodson Painting has dedicated workers who have been painting with us for over 10 years and know how to do every aspect of every job, the correct way. Customers can feel comfortable trusting their home improvement needs to Goodson Painting. Dave Goodson, owner of Goodson Painting Company, has been in business since 1996. Dave interned with his father-in-law, a master painter, with over 52 years of experience. Dave is a color expert and will help homeowners choose the right shade of paint for each surface and offer suggestions to improve the overall appearance of their home.